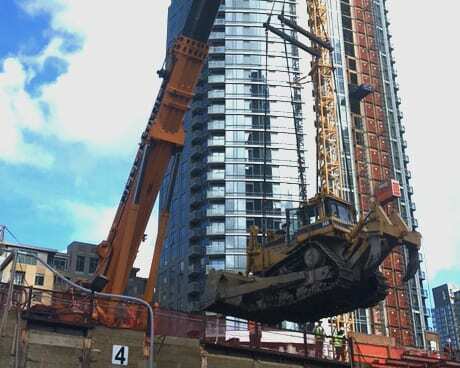 With loads coming in at more than 100 tons, suspended 200 feet in the air, experienced operators are an absolute must for any heavy lifting project. Without proper lift engineering, the operator, ground crew, load, and machinery itself can be compromised. Many of these safety steps happen before the load is even off the ground. However, If not paying attention during any part of the lift, ground crews could be putting themselves in grave danger. Constant communication is key, from the riggers to the operators, and everyone else in the crane work area. The majority of accidents happen at pinch-points, where an inattentive crew member could find himself bruised, battered, bashed - or worse. These points can be found within the load itself, between the load and the rigging, or between a literal rock and hard place. For example, an uneven load could suddenly shift when the load is first lifted. A misplaced hand could get caught between heavy wooden beams, steel girders, or whatever is being lifted. The lift needs to be halted, load lowered, and secured before the extraction can begin - an eternity if it’s your hand that’s stuck. This is where a properly trained rigging crew is invaluable. Using hand signals to communicate with the crane operator, immediate action can be taken if something goes wrong. The rigging crew will also make sure the load is properly loaded to prevent any shifting during the lift. Crew members should also be aware of safety hazards around the load. Getting caught between a large storage container and a load that unexpectedly swings does not make for a good day at the office. Being aware of these dangerous situations should be part of safety planning for every job. Even before the crew arrives at the job site, steps can be taken for safety. Long shirt sleeves, oversized sweatshirts, or baggy pants can all get caught in a pinch point if the crew member isn’t careful. Long hair should also be secured and gloves should be well-fitted. A dangerous situation can present itself in an instant, that’s why NessCampbell employs regionally based safety professionals throughout Washington and Oregon. Through proper planning and preparation, as well as healthy amounts of precaution, pinch points and other dangerous situations can easily be mitigated.